Sagrantino is an Italian grape variety that is indigenous to the region of Umbria in Central Italy. It is grown primarily in the village of Montefalco and the surrounding area, with a recent rapid increase in planting area from 351 hectares (870 acres) in 2000 to 994 hectares (2,460 acres) by 2010 dedicated to the grape, in the hands of about 50 producers. The origins of the variety are unclear and poorly documented, but the first written record of it is in Umbria in the late 16th century as a communion wine, although Pliny the Elder mentioned red wines from Montefalco that may have been Sagrantino. The name itself is also of uncertain origin, possibly from sagra (feast) or sacrestia (communion wine). Sagrantino is a vigorous, relatively disease-resistant yet low-yielding vine. Although it flowers early, and reaches veraison early to form thick dark skins and large pips, it requires a long hot season to ripen, producing small slightly conical winged bunches, late in the season; in Umbria usually late October. Historically Sagrantino was used primarily for making sweet passito wines, partially drying the grapes to yield a thick, syrupy wine with raisin and blueberry qualities, much like a Recioto di Valpolicella. Since the 1970s however, the wines have been made principally in a dry secco style, with typically bold extraction and complete fermentation. 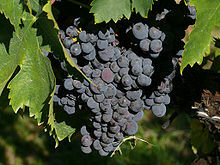 The grape has one of the highest tannic levels of any variety in the world. Its wines contain more tannin than those made from Aglianico or Tannat, and twice the level of Cabernet Sauvignon or Nebbiolo wines. It creates wines that are inky purple with an almost-black center. The bouquet is one of dark, brooding red fruits with hints of plum, cinnamon, and earth. Montefalco Sagrantino, granted DOCG status in 1992, requires the use of 100 percent Sagrantino grapes, with a minimum of 37 months' aging before release, 12 of which must be in oak barrels. With production still relatively limited, the wine is not widely known outside Italy. Australia has now seen forms of this varietal from wineries such as d'Arenberg, Pizzini, Chalmers, Mitolo, Balancing Rock and Amadio Wines, all with varying styles of Sagrantino. Figures are hard to obtain for such a tiny segment of the industry, but one source estimated about 20 hectares (49 acres) in 2010, mainly in South Australia and Victoria. ^ Anderson, Kym; Aryal, Nanda R. (2013). Which Winegrape Varieties are Grown Where? A Global Empirical Picture. University of Adelaide Press. doi:10.20851/winegrapes. ISBN 978-1-922064-67-7. ^ "Consortium Montefalco". Consortium Montefalco. Retrieved 24 July 2015. ^ D'Agata, Ian (2014). "Sagrantino". Native Wine Grapes of Italy. University of California Press. pp. 424–426. ISBN 978-0-520-27226-2. ^ Khan NQ, Patel B, Kang SS, et al. (20 May 2015). "Regulation of vascular endothelial function by red wine procyanidins: implications for cardiovascular health". Tetrahedron. 71 (20): 3059–3065. doi:10.1016/j.tet.2014.10.078. ^ "Consortium Montefalco - Sagrantino, Umbria's Jewels". Consortium Montefalco. Retrieved 24 July 2015. ^ Rowley, M. (2010). "Interest in Italian varietal beauties turns heads toward Sagrantino". Australian Viticulture. 14 (5): 84. This page was last edited on 18 February 2019, at 23:18 (UTC).